I have never really looked at Allergan but was horrified to find a rewards program for using Botox (a toxin derived from botulism and which makes your skin taught by killing anything that causes wrinkles). Yes, take your Botox injections and earn 200 points... trade your points for free drugs. Downstream cosmetic surgeons can also sign you up for the "Brilliant Distinctions" program and presumably they earn referral fees. Along with free Fentanyl - something more widespread than the I originally thought, you can be passed out and fully plastered in America. 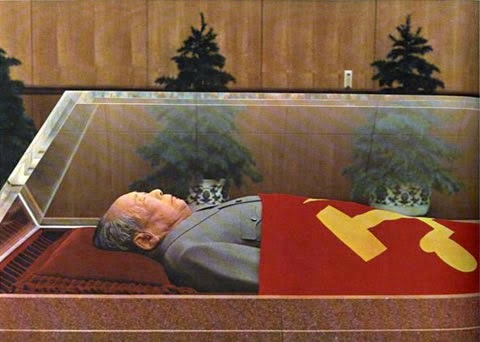 Your chance to look like Chairman Mao under the glass, glazed eyes, skin stretched taut. Yes, that is an A+ rating. The alert is for pending government investigations (something that has been in the press lately). 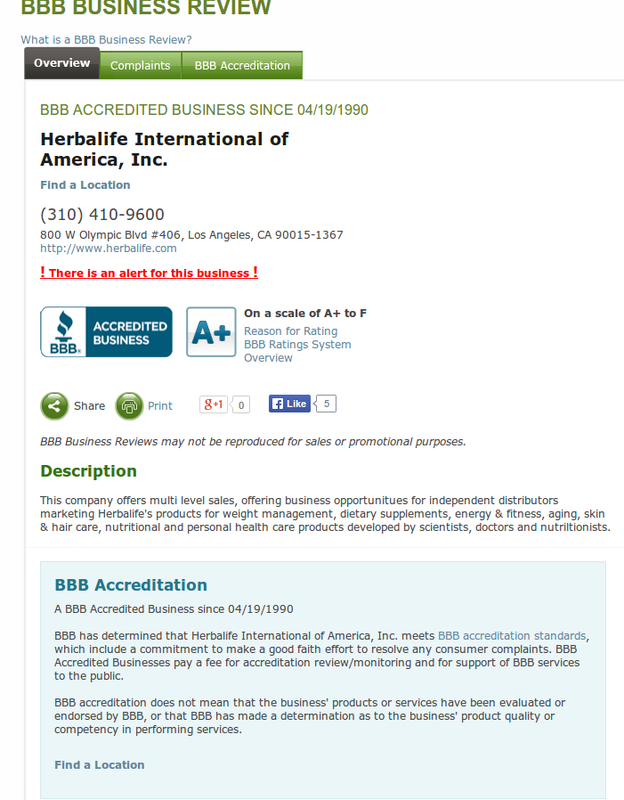 BBB has determined that Herbalife International of America, Inc. meets BBB accreditation standards, which include a commitment to make a good faith effort to resolve any consumer complaints. BBB Accredited Businesses pay a fee for accreditation review/monitoring and for support of BBB services to the public. Response to 8 complaint(s) filed against business. I have seldom seen a position where the New York intelligentsia and the facts on the ground disagree so strongly. What if anything is civil insider trading? The SEC today laid civil insider trading charges against a BP executive who (they allege) had information about the magnitude of the Deepwater Horizon oil spill before that information was public. On April 29 and 30, 2010, while in possession of this material, nonpublic information, and in breach of duties owed to BP and its shareholders, Seilhan caused to be sold his and his family’s entire $1 million portfolio of BP securities. Specifically, Defendant caused to be sold his and his family’s holdings in the BP Stock Fund, a fund consisting almost entirely of BP American Depository Shares (“ADSs”), held in Defendant’s and his family’s retirement accounts at BP. In addition, Defendant exercised three different sets of options to purchase BP ADSs and immediately sold the underlying shares. This was nine to ten days after the explosion and Deepwater Horizon was already on the front page. The main argument for the story was that when he sold the "official" leakage rate was about 5,000 barrels of oil per day. This was adjusted upwards eventually to over 50,000 barrels per day and the defendant knew that the real flow rate was higher than the publicly stated flow rate. Vast swaths of reddish brown were visible Monday afternoon from a Coast Guard helicopter hovering 400 feet above the drilling site, where the small armada of ships hired by BP worked to collect the oil. A few miles away, a C-130 airplane released chemicals to disperse the long column of oil. A lighter sheen seemed to stretch to the horizon. Wildlife is already starting to be affected, and three sperm whales have been spotted in the area that is covered by an oily sheen. Cleanup crews from Louisiana to Florida are setting up booms intended to block as much oil as possible from coming ashore, said Steve Benz, chief executive of Marine Spill Response Corp., an industry-funded nonprofit company that cleans up spills. The crews are also preparing to clean up any oil that does come ashore. Investors are growing worried about the rising costs associated with shutting off the well and cleaning up the spill. BP's American depository shares fell 3.3% to $57.91 in 4 p.m. Monday New York Stock Exchange composite trading, as other large oil companies rose in value. The spill stretched about 100 miles and I suspect simple maths might have told you the spill was fairly large. The share sales happened nine and ten days after the oil spill - and when - and I remember it at the time - BP completely dominated the financial blogosphere. I am struggling here to see what the case might be. This is a civil case. If it were a criminal case I would have a very hard time convicting. The executive was - like many executives - overweight his company's shares and saw his career and financial wealth dissolving. He waited until the WSJ had a fairly accurate picture of the problem and then sold his shares. As far as I can see civil insider trading is when the case is too weak for Preet Bharara and the SEC doesn't want to seem useless. In other words it is when the government ruins someones life without enough evidence for a criminal conviction. This is - or at least should be - a criminal case. Or it should be dropped. I would go for dropped but the SEC might have better information than me. But in that case they should be convincing Mr Bharara and I would be all-in-favour of the Attorney trying the case. It should be noted the case was settled. I was not the only person who viewed the case as weak and the government as heavy-handed. That said - its probably a good policy if you are an employee of Goldman Sachs to sell ONLY on the day after earnings are announced. There is a strong case for being purer than the driven snow. After all, the government employee who is going to prosecute you makes MUCH less money than any mid-level Goldman Sachs employee. There is an article in the New York Post about me. I have absolutely no idea of the issues involved at Harvard Illinois Bancorp - but they led to one of the funnier dissenting proxies I have ever seen. Photo taken at annual meeting on May 23, 2013 at 2:54 pm. I finally got out of the hotel and walked around the street of Charlotte a little. Still sick, just less sick than this morning. The sun was out. The weather was perfect. The blossom pink on the trees and everything so clean. Last time I was here was I think in 2002 and it was a brief visit. I met with the investor relations departments of Duke Energy, First Union (!) and Bank of America. It was the BofA visit that defined the trip. We have 36 billion dollars in revenue. 18 billion in costs and 4 billion in credit costs. Surely it is more important to watch where the 36 and the 18 go than to focus on the 4. The world in Charlotte is so clean. I am sick in bed in a hotel in Charlotte. I had a flight booked tomorrow from Miami to Boston - but there is not a chance in the world I can make that flight. So I tried to cancel. I logged in to American Airlines website. It didn't work. It turns out that if you booked on an Australian website you need to log into the Australian website even when you are in America. Logged into the Australian website and found my flight. Got up the ticket but there was no refund option. So I googled American Airlines refunds. American Airlines has a separate website for refunds (I guess they are hoping that some people can't find it and they can deceive them out of a fare). Alas I could not log in with my Australian booking number. So I googled refunds, American Airlines Australia. There is a site and I could find my booking but there was no option to refund. But they did link a phone number. Got put through to a voice recognition phone centre that could not recognize me. After about ten minutes I get an operator who can't do the refund - but they did eventually transfer me to an international operator who could do the refund. Slowly. I assure you that it is harder to get a refund from American Airlines than it is as a Herbalife distributor. And the process is far more deceptive. I am waiting until some hedge fund manager comes out with a billion dollar short on American Airlines. Meanwhile I am going to write to the Federal Trade Commission about American Airlines unfair behaviour. You see the practice of American Airlines - which makes it ridiculously difficult to claim a refund which you are entitled to seems unfair. I guess if it is "reasonable" then the Commission has no power to declare it unlawful on the grounds that it is unfair. The process at Herbalife is much easier. It is reasonably easy to get a full refund and the refund includes postage. The section above somewhat it seems limits the FTC's power in the Herbalife case.